Two years ago I had just completed a two week residential training course at assistance dog charity Canine Partners' Midlands centre. During the two weeks I learnt how to work with Elgin, and learnt all of the different tasks he'd been taught my his amazing trainer. At the end of those two weeks my new assistance dog, Elgin, travelled back to Devon with Mum and I.
Elgin at the training centre. The course was hard work, I found it physically and mentally exhausting because there was so much to learn. But it was 100% worth it. During those two week I started to bond with Elgin, as I was essentially a stranger to him, having only met him once before on our matching day (when the disabled person meets a dog or dogs so that the trainers can see if you work well together). It was amazing had quickly he did bond to me, I think he knew that I needed him and he wanted to help. Elgin is a very sensitive boy and he very quickly started to pick up on how well I was or how much pain I was in. He knew when to be gentle, and he knew when to act the fool to cheer me up. Elgin and I practicing his 'my lap' command. This is where he gently puts his front feet on my lap. This is useful for when I need to put his working jacket on, and for passing me objects if I'm unable to stretch or bend down to his level. During the two weeks we did a lot of public access training, where we went into town centres, shops cafes etc. I found this all very scary as at this point I'd hardly left the house for two years, but with Elgin by my side my confidence grew. 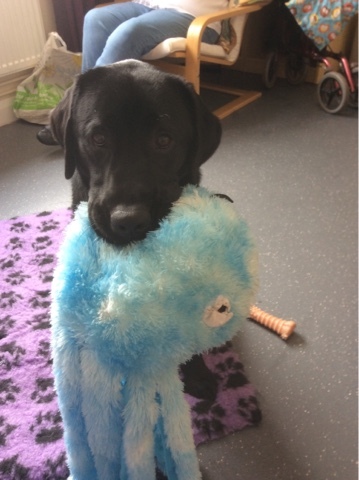 Elgin in our room at the training centre, trying to get me to play with his toy octopus! In the two years since the training course my health has rapidly deteriorated, plus I have lost all of my hair to alopecia. Back then I could walk a few metres around the house, now I can only walk a step or two (and some days even that is impossible ). I'm now a full time wheelchair and need Elgin's help more that ever. He is an incredible dog, he loves work, he always wants to please you. His tasks are all fun to him and they earn him his two favourite things - treats and praise - he would work all day if I let him! Five minutes after Elgin met Jessie and Henry for the first time. 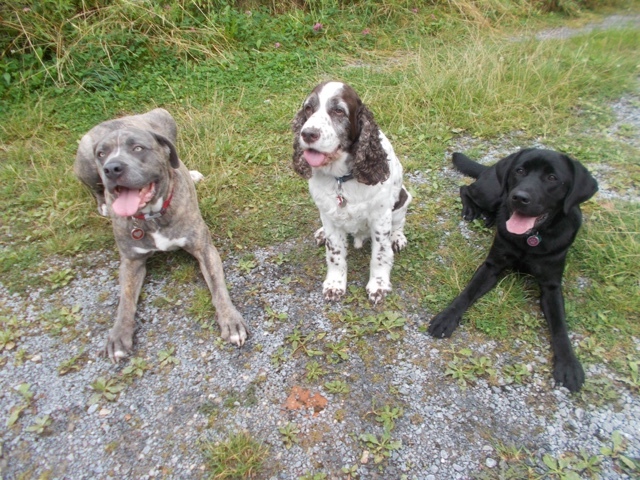 On the way home from the training centre I was worried how Elgin would react to my two pet dogs, Henry and Jessie. 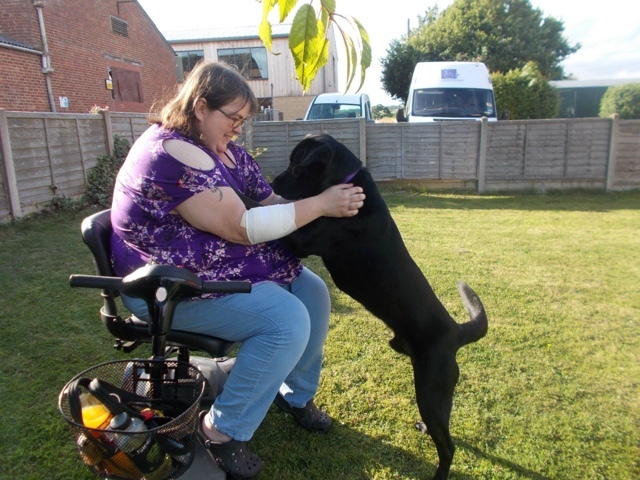 They'd never met before but canine partners' trainers had assessed Jessie and Henry's characters and chose a dog who would play with Jessie, but be gentle with Henry who was 13 at the time. Well the trainers certainly matched them well! All three instantly became best friends. Sadly Jessie and Henry have now passed away, I think Elgin misses them, especially Jessie who was his playmate and partner in crime. The last two years have been tough, I've had a lot of health problems, including a stroke the day after my 36th birthday. But with Elgin next to me I can get through anything. 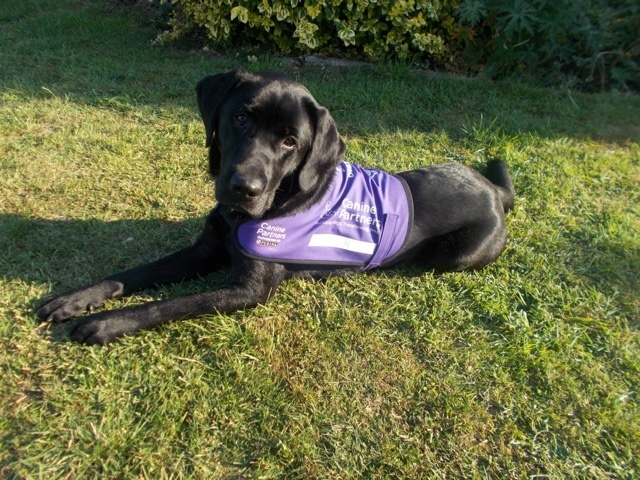 Elgin is a special dog, I love him more than words can say, and I'm so grateful to Canine Partners for bringing him into my life.